Yup, it's true. Google will now be inserting (or, at least, testing)Tweets into AdSense advertisements. The first company to participate in the alpha testing was Intuit's TurboTax. My initial reaction to the news ranged from "No way will this work" to, "Maybe...?" to, "This disgusts me" to, "I respect the effort"... and I still haven't seen it in action. Marketing Voices Podcast has an interview with Intuit’s director of online advertising and internet media, Seth Greenberg (which you can listen to below), and, despite my initial reservations, I found myself impressed with Intuit's approach,and Seth's attitude towards what he calls the "test." "We're not changing the way we talk ... we're not optimizing for broadcasting, we're optimizing for individual relationship ... we're not trying to buy followers, we're just trying put out the same message that you probably wouldn't see in other channels." Although Seth said there is "very little downside," I wonder if that's true. Will Twitter users actually be interested in starting a relationship with a brand on Twitter through an ad? Or will they find it impersonal and too salesy? Judging from its Twitter feed, I wouldn't say Turbo Tax is too salesy; its tweets are filled with @replies and customer service outreach. 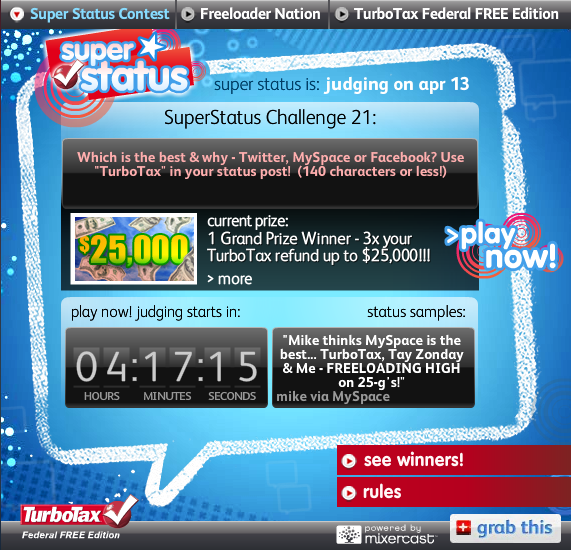 Additionally, this isn't Turbo Tax's first exploration of social media, and it certainly isn't the only initiative they have running -- its been running a little contest called Super Status Contest, which allows users to enter a contest via tweeting. So far, it's getting moderate pickup.